A guest podcast with Chris & Bryan covering “Dune.” They talk about the book, the film, the mini-series and the whole enchilada. I’m really enjoying the guest podcasts and quality we have been getting this year. Everyone is doing a great job and really stepping up to the challenge of covering some complex and interesting subjects. Here’s a bit more from this week’s podcast guests about this guest spot. 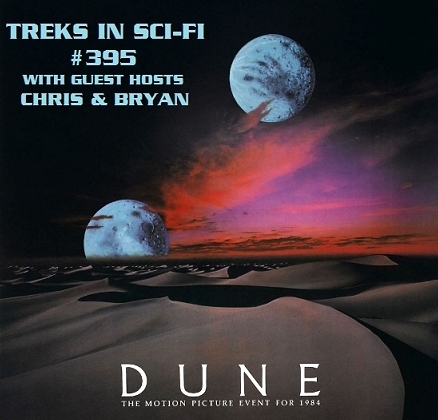 This week, guest hosts Chris Clemente and Bryan Dunn cover Dune! We cover the novel, nitpick the film and miniseries, and reflect on the story and the impact of the Dune novels. Put on your stillsuit and join us! I want to thank Chris and Bryan for covering a favorite subject of mine as I am a big fan of “Dune.” I will be back next week with a look at the Enterprise episode, “Zero Hour.” Take care until then and enjoy your week ahead.